When creating this Fantasy Feud review, we realized that FantasyFeud.com is a daily fantasy site that doesn’t get the respect it deserves. With its clean interface, exciting game offerings and the daily fantasy industry’s first rakeback program, Fantasy Feud may make some of the other daily fantasy sites rethink some of their principles, as well as how they offer games to fantasy players. With the fantasy sports landscape starting to get crowded with new up-and-coming sites, FF may be poised to make a run to the top of the list of daily fantasy sports sites with some of their innovative thinking. 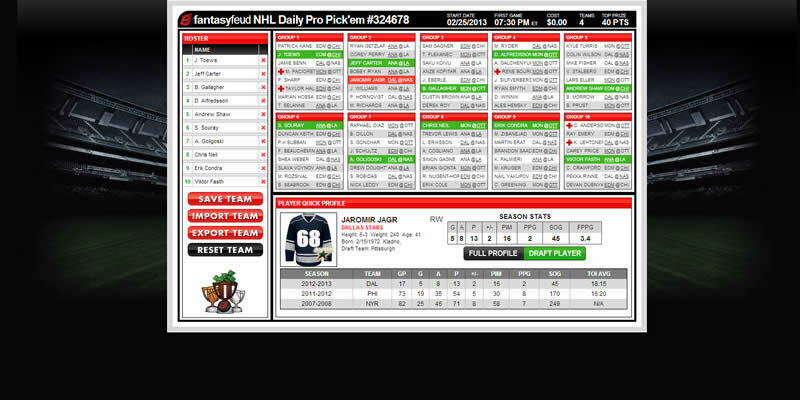 They were the only daily fantasy site that offered Fantasy Hockey for the Olympics in 2014 and with their survivor style fantasy game, players that join Fantasy Feud will always enjoy the game play. When joining FantasyFeud.com, don't forget to use Fantasy Feud Referral Code REALMONEY to get a deposit bonus of 100%...a nice extra bonus. For now, our Fantasy Feud rating stands at 3 stars out of 5...but once their player base and Guraranteed Prize Pools grow, they will ultimately advance in our list of daily fantasy sports site reviews. 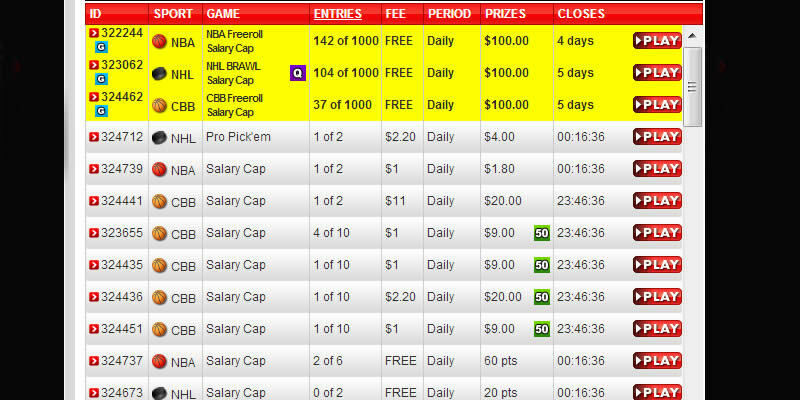 Salary Cap - Choose a team of players and fill a fantasy roster using a salary cap of $1,000,000. Pro Pick’em - Pick who you think will be best out of a pool of players. Basically a box pool. Snake Draft - Snake Draft is your traditional fantasy pool draft where you take turns making picks and in a predetermined order. Survivor - Longer contests usually resulting in playing various players head to head until a winner in determined. Survivor games only come out occasionally at FantasyFeud.com. 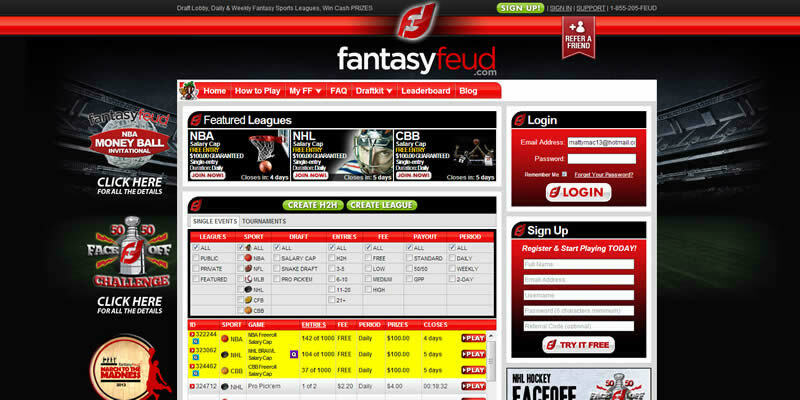 The Fantasy Feud Lobby is nicely laid out with a selection of all available fantasy games right in the middle of the screen as well as a menu bar above it that allows you to narrow your choices by type of league, sport, type of draft, how large a league you want to enter, entry fee and the duration of the fantasy league. On the right hand side of the screen is the Quick Menu that has tabs to get you to the Main Lobby, My Leagues, My Challenges, Past History and a Message Center. Above the Quick Menu is your cash balance as well as a handy deposit button. Below the Menu, is usually an ad for the top promotion being run at Fantasy Feud as well as a leaderboard and links to their social media. Jumping into the interactive portion of the site, there is a Chat Bar on the right hand side that allows you to chat openly, or message a player privately if you see that they are currently active. Fantasy Feud players can also click on an opponent's profile to read their stats and to challenge them to a Feud or into a league that you have created. If you aren’t the friendly sort and just want to play the game, you can simply click to close the chat room and focus on picking your fantasy games and getting down to making money. Once you’ve selected a game to join, the game screen that appears is well laid out and makes it easy to choose your fantasy players and get in on the game action. During our FantasyFeud.com review, we found that on some browsers there are occational software glitches, but each time we contacted Fantasy Feud, they were quick to fix issues that we discovered. 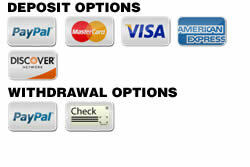 Deposits can be made easily through credit cards Amex, Visa, MasterCard or Discover. You can also deposit to FantasyFeud.com via PayPal. There is a minimum deposit of $20. Upon deposit, you will receive a 100% deposit bonus up to $500 if you use Fantasy Feud referral code REALMONEY. You need a minimum of $20 in your account to make withdrawals which can be made through PayPal or Check. Payments are processed quickly, but then it’s up to your local post office as to how long for the check to arrive. Like other reviews, we decided to test out the Fantasy Feud customer support. Their support team can be reached through their live chat, by opening a ticket, Twitter, Google+, Facebook, emailing them at support@fantasyfeud.com, or if you want to talk to a real person you can dial 1-855-205-FEUD. We checked the chat section often, and found there was always someone there to answer questions throughout the day and evenings. Their support staff gets issues resolved quickly and as a player, it’s a comfort to know that someone will respond to issues almost immediately. For our Fantasy Feud Review, I used an Android smart phone to check out the site. Upon punching in the address, you are greeted with a screen that says it has detected a mobile device and you are faced with 2 choices: mobile site and full site. For those with a big enough screen on their phone, having a choice instead of having to scroll through and find the full version of a site is a nice feature to have. The FantasyFeud.com mobile site is very simple with choices of Lobby, My Games, Cashier and Support. All the info is there for players and even if you own an iPad or an iPhone, if you are a mobile fantasy player, you will have no issues playing games at FantasyFeud.com. If you love playing different styles of fantasy games then you will love playing at Fantasy Feud. With so many types of games to play as mentioned above, you can stay entertained while making money at the same time. For our Fantasy Feud review, we chose a salary cap golf game to play in. The screen that appears is well laid out - your roster spots are on the left of the screen and the available players are on the top half with detailed stats. If you click on a player, a Player Quick Profile section gives you more detail of fantasy stats. If we had one complaint, it’s that when you pick a lower priced salary cap player, the list of players automatically jumps back up to the top. We found a bit irritating to search for the cheaper options, but I guess players get used to it. Once your games begin, fantasy stats are updated almost in real time and allow a player to sit with the screen open instead of watching multiple live events. 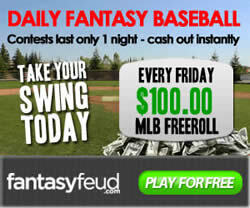 We have to mention for our user experience, that Fantasy Feud offers to all fantasy players a Rakeback Rewards Program. The Rakeback Rewards Program allows players to be rewarded for their loyalty to Fantasy Feud by offering exclusive freerolls and Fantasy Feud promotions for all of their rake back levels. This Rakeback Rewards Program gives players even more ways to win cash prizes. The Rakeback Rewards Program allows fantasy players to receive cash back for all FantasyFeud.com paid games by receiving back a percentage of their game fees each and every month, depending on their membership status that they have reached through their previous fantasy games play. Currently, no other daily fantasy sports site offers Rakeback, so this is a definite plus when looking for an online fantasy sports site to call home.